PRIVATE MOUNTAIN ESTATE Two homes for the price of one on 23.29 Acres. Traditional 4/2 residence offering Greatroom, stately FP & Cathedral ceiling, large Southern Kitchen with dining area & bay window. Master on Main with Garden tub, Laundry & bonus room. Two generously sized bedrooms on 2nd level with Dormer windows. 1-car garage or workshop area. Front porch with swings & ceiling fans. Large yard with acres of wooded property in Peaceful community. Chain-link fence in front shared with 2/2 single-wide home with CHA & frame additions that is move-in ready. Separate workshop or barn. Small branch on Western property boundary. 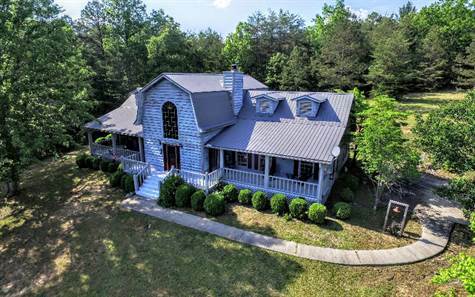 Private location for Equestrian use or great Mini-Farm. Non-restricted - No HOA - New survey.